This brooch was inspired by the beautiful Ann Hull’s sampler. A few years ago I saw this sampler on eBay and I was so fortunate to win the auction for it. Ann Hull stitched her sampler at the age of 11 in 1836 in England and used many motifs and symbolisms of antique samplers. 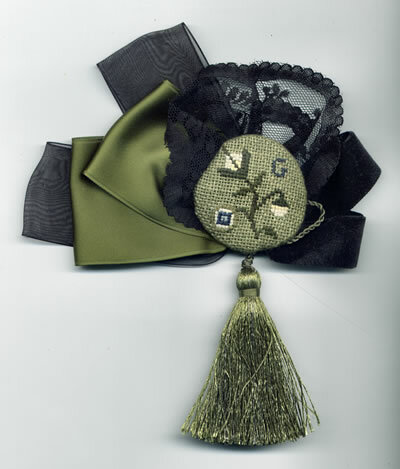 Embroidered with one of the motifs of the sampler, the Ann Hull’s brooch is also an elegant eyeglasses holder pin. It is stitched with silk threads from The Thread Gatherer over hand dyed linen from Weeks Dye Works. I also created a purse that matches with the brooch and the chart is available as a separate design. Threads Threads: hand dyed 12-stranded silk threads from The Threads Gatherer: Aqua Clouds SNC 043, Camouflage SNC 055, Honeysuckle White SNC 144, Moon Flax SNC 143, Dried Thyme SNC 156, Union Blue SNC 1063.